This is another exhibit at the NYC Fire Museum. This particular piece is a 1912 steamer. Steam does not provide the propulsion, however. The propulsion is provided by a 1912 gasoline-powered Van Blerck Tractor. These pieces were common around the turn of the century, when the gasoline engine made its debut. 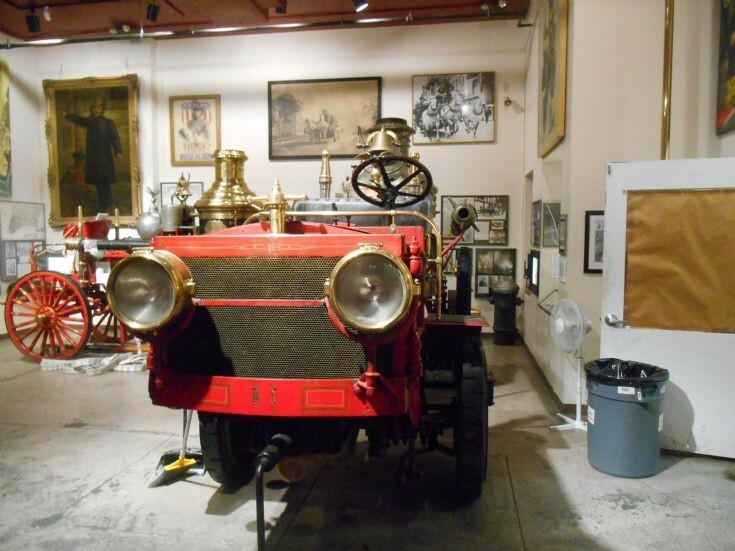 Many fire departments, the FDNY included, made these hybrids out of concerns over the reliability of the gasoline engine in contrast to the well-proven reliability of the steam engine. This photo was taken on 9th January 2014. Tiger - there was also a cost issue. Many of these horse drawn steam pumpers had years of life left in them, but the economics of keeping horses and paying coachmen made changing over to motor propulsion a very attractive proposition. Many of these conversion tractors were in fact petrol-electric hybrids, with the gas engine powering a generator, which supplied current to either hub motors or wheel motors. One of these is also on display at the FDNY museum and is illustrated on this site. But horses continued to provide motive power for many FDNY apparatus up to 1922. Germany and France also went through this transitional phase, but in the UK the change over to petrol powered fire engines with PTO-operated pumps skipped this step, although there were some battery-electric units in big cities like London. Added by Rob Johnson on 29 January 2014. Up here in Dundee (Tayside)we had our 1st motorised appliance in 1908 and the Last of the horses was disposed of in 1917. Added by Grant Melville on 30 January 2014. Grant - it seems your brigade was well ahead of the trend. In their 1913 report, the London Fire Brigade "had not decided to universally adopt motor traction" - but they had worked out the estimated cost of completing the conversion to 100% motor. How much? Would you believe 160, 000 pounds, or around 1, 000 pounds per unit! I think the success of motor lorries during WWI accelerated the trend, but there were quite a lot of small town brigades still relying on horses as late as the beginning of WWII in 1939. Added by Rob Johnson on 20 May 2014. The first petrol powered UK fire appliance was a pump escape built in 1904 by Merryweather for the borough of Finchley, which was not in the London County Council area back then. London first bought cars, but not fire appliances, in 1906. The Merrweather had a mid mounted PTO drive 250 GPM (1135 LPM) reciprocating "Hatfield" pump and carried a 50 foot (15 meter) wooden wheeled escape ladder. Merryweather continued to build piston pump appliances for another fifty years, even though Dennis started supplying centrifugal pumps as early as 1908. Added by Rob Johnson on 21 April 2017.